Regardless of the function, product launch or ceremony, a significant question to answer is, who will have the responsibility to host and execute your next event? Leading organizations such as IBC Asia, Questex, The I.T. Management Association, DHL, Key Media Singapore, British Chamber of Commerce, Austrade, Toast Masters International, The CPA Society, Quorum Magazine, The National Trust of Australia, the American Chamber of Commerce, Rotary International, Sydney Convention and Visitors Bureau, Ronald McDonald House Charities, Armenian Chamber of Commerce, Sydney Chamber of Commerce, South Western Sydney Institute, the Australian and Asian National Speakers Associations, the International Coaching Federation and Vietnam Airlines have retained Rob as an MC, Host or event moderator at their significant conference and client functions. To book an MC or host, contact rob@strategicresources.com.au or your favourite speakers bureau. After 15 months of research, live audience workshops, interviews and workbook creation, three leading Australian based professional speakers share their insights as hosts having emceed thousands of international events and experiences between them. Designed to save anyone from shaking hands at the podium, the fear of a tremblinb voice, the common pitfalls of introducing others or the protocals from the boardroom to a conference to a product launch or annual general meeting. Individual live studio interviews by Australian radio personality Steve Barker with Mike Schoettler, Camille Valvo and Rob Salisbury are upbeat, candid and packed with industry trade secrets proven to work and have audiences wanting more. 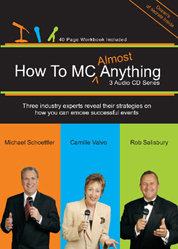 This 22 audio track 3 CD audio series, 'How to MC Almost Anything' with nearly two hours of audio content and a 40 page MC workbook is a perfect addition to company learning libraries, educational institutions and for business people wanting to build their skills as a Master of Ceremonies, Host or Moderator. Just $85 (Aus) plus a nominal amount for shipping and handling of $3 within Australia and $5 internationally. Take advantage of travel time. Play your MC CD series in your car CD player or laptop while commuting prior to conferences or events. Purchase multiple copies to shape the MC or hosting learning curve of your team ensuring the perfect experience for your guests, delegates, board members or shareholders. Copies can be obtained by calling + 6 12 8250 4470, e-mailing rob@strategicresources.com.au or by downloading the brochure and posting or faxing to our office Sydney or Singapore offices. Your MC CD pack with bonuses will be sent after confirmation of your order and sent to your office or home for delvery in a few days. To ensure a great return on your event investment, hire a Professional Master of Ceremonies, Host or moderator as a partner in your project. Their help with speaker transitions, themes and logistics will look and feel seamless adding that extra degree of event insurance. An MC or host is often compared to liquid cement as they keep dozens of pieces together, yet have to flexible to change and conditions. Effective planning and open communications with your MC brings confidence and certainty to any occasion. Over many years, meeting planners, human resource directors, general managers and CEO's have invested thousands of hours and millions in venue selection, theme creation, food, drinks, gifts, selected speakers, special dignitaries, awards, silent auctions, travel, hotel and fanfare for special occasions. This type of extensive planning and budget makes it all too important to have the right host or MC from the beginning to the very end. Working closely with your MC and host will ensure your event runs to time while you and your guests relax and enjoy themselves. Regardless of your event size at from 12 to 2500 or more, Rob or one of his MC partners can provide the perfect opening and closure to the last word. Your event can be peppered with fun, flare, and audience participation or in an ambience tailored to the magic you have planned with singers, musical acts, comedy or other entertainment options. Having grown up in the USA with a distinctive Californian accent and a resident of living in Australia since the mid 1990's, Rob is known for getting points across with clarity, confidence, conviction and in a relaxed manner to exceed your requirements. Ensuring the opening and closing carry major impact, he and his team work closely on the correct pronunciation of unique names and the acknowledgment of your special guests, suppliers, contributors or sponsors. Rob understands the importance of proper lighting, staging, working with sound and video production teams, the flow of meals and how event entertainment must be co-ordinated through a co-operative and flexible approach to each event. By hiring Rob or one of our MC or host partners, your organisation and audience will clearly understand the flow of your function on the day, night or over several days. Ultimately, it is about you, your guests or delegates having a great time. All the credit for running an event or program to perfection will go to the most important person who booked the right MC and host....YOU. 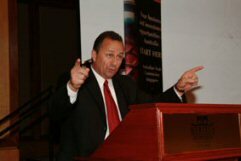 It is my pleasure to recommend Rob Salisbury to emcee (MC) your conference or gathering of professionals. Rob not only set the tone of the conference, he managed all the "pieces" so they fell together seamlessly well. My keynote was the kickoff event. We met before the event to make sure everything was in order and that we were in sync for my introduction. Before coming onstage, Rob energized the (300 person) audience so they were eager to hear me speak. He took the information I gave him and tailored an introduction for me that both laid out my credentials and offered a bit of relevant humor. During my speech, he took pictures of me and kept an eye on how I was presenting. During an exercise that had the audience engaged, he was able to recommend areas of the stage to avoid that had been creaking. It felt good that someone was watching over me and available to help. Rob adds his own warm sense of humor to his part as MC. He is a great conference/meeting host and serves well to keep everything flowing and the energy upbeat until the end. You will not regret your decision to hire Rob for your event. 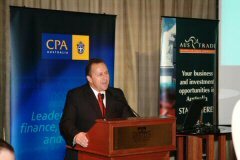 "Rob Salisbury did a great job of emceeing (our recent Sydney event). He had the right balance between protocol and fun - his planning and attention to detail ensured that the program ran very smooth. Rob was able to generate a warm, positive energy for the event and his insightful questioning of the (CSP) panel ensured participants got the maximum value from the speakers." What can I say? You were the perfect MC Host for our three day National Conference and Convention. Professional, fun, warm, giving, knowledgeable of our members and the requirements of the Executive Committee and Board of Directors. The contribution you made to ensure our convention was one of our best ever exceeded our high expectation and brilliant from the opening day to the last. In particular, your hosting of the awards night and theme costume party, "Pirates of the Caribbean" in the hotel are still being talked about weeks later. I now more then ever appreciate the value of "the right MC and host". We can't wait to work with you again. Love your work. Thank you for all your help in 2006 and the insights that took shape regarding our DHL client conferences and special staff projects in the SE Asia region. I first learnt of you from the MC CD program that a colleague had received. From that, we met and have had great results to show from our times in meeting. Of particular note is our March 2006 Hong Kong regional leadership conference with our 200 senior management and key clients during a two day event. I had the task and privilege of hosting that event and admit, it was at first,a real stretch for me. You covered allot of up front preparation and planning areas that paid dividends as noted by colleagues and senior management. At that event, I felt competent, confident and comfortable from the opening moments of the first day right through to the key client dinner and more speeches by company and client dignitaries present. There have been other moments that your advice and recommendations have made a big difference. In many cases, you were not physically at the meetings or conference but your spirit of support never ventured far from our telephones or e mail conversations. Regardless if our meetings were at our office or off site, your ideas and suggestions ensured we made decisions with a clear view and outcome with each program. I am working on several large events and projects for 2007 of which we can talk more about when you return in March. I appreciate you holding the line in challenging areas and more so, your help when working through our planning and budget constraints to find fresh ideas. This letter is for two reasons among the many I could write. The first is to say "Thank You" for agreeing to MC and host my second book and public launch of "Why Entrepreneurs Should Eat Bananas" at the American Club in Sydney. 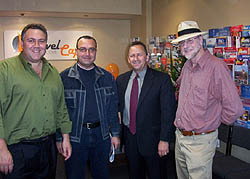 We had dozens of long-term clients and friends attend, plus my special guest, the Hon. Fran Bailey MP, Federal Minister for Small Business and Tourism. You more than covered everything we planned. You freed me up to do what I needed to do in order to meet and greet everyone plus sign copies of my new book. The second reason for my letter is to recommend you to others who may not be aware of your services or the manner in which you work. Having been an emcee and host on many occasions myself, I know the realities of working in advance of an event, of keeping to a run sheet, of introductions and thanking people, of keeping to time and in creating a relaxed mood. As a beneficiary of your contribution as my event MC and host, I now know the value as well. Thanks Rob for your help over these past few weeks and I would be pleased to talk with anyone about your skills as an "MC" and host. It has been a pleasure to not only know you since 1996, but most importantly, to have worked with you at various times and expand our business and on going friendships. Long may it continue. Author of the 2006 Best Seller, "Why Entrepreneurs Should Eat Bananas"
Thank you so very much for being the Master of Ceremonies of our Melbourne Cup luncheon. We are thrilled with the nearly 200 members and guests in attendance. As always, you bring a very professional touch to this event and from the moment you arrived, I knew it would be a great day. We had a wonderful celebration with our best hat contest; prize drawings and historic third Melbourne Cup win by Makybe Diva. Rob, your preparation in advance reflected with many bits of interesting facts and stories relating to the largest society gatherings and annual sporting occasions in Australian history. I particularly appreciate your ability to cope with the unforeseen circumstances you incurred in a most diplomatic and professional manner. Your relaxed, yet in control manner ensured everyone enjoyed themselves immensely. Overall, your participation ensured that the event was a huge success run to time and without incident. We look forward to the next opportunity to work with you. The evening of Monday 31 October wasn't just "the night before the Melbourne Cup". It was the night that sent the message out loud and clear that (our customers) "Love Our Quorum" magazine. The team at Quorum Publishing would like to thank you for guiding us through the formalities of the evening as our MC and to celebrate on the night, the positive new direction that our team and our three publications are moving forward with. The timeless style of the iconic Marble Bar at the Sydney Hilton bubbled with energy from a crowd determined to enjoy the company of industry colleagues, door prizes, plenty of amazing food and drink, and of course, a memorable performance of "Hey Big Spender". Rob, thanks and very best wishes from the Quorum Publishing Team. From all of us at Key Media and the Human Resources Summit team, THANK YOU for agreeing to be The Masters of Ceremony at our 2005 HR Summit in Singapore. The year's event would not have been possible without your invaluable experience and contributions. The feedback has been extremely positive in terms of the topics and quality of speakers at each session. All of the sessions were well received which impacted the majority of the 1400 HR professionals present - many said our 2005 event was "the best yet"! Once again, thank you for your invaluable contribution towards making this happen...we couldn't have done it without you. On behalf of the 10 Rotary Clubs of Sutherland Shire and our 100th year Rotary Centenary Celebration teams, thank you for your contributions as one of our two Master of Ceremonies on 19 February. 5. Rob, I have seen you as a presenter, speaker, judge and Master of Ceremonies on numerous occasions since first meeting you a few years ago. I am particularly impressed with the detail on each individual presentation you deliver or are asked to be a part of. Nearly 200 Rotarians and guests were once again in the hands of a professional. You not only cared about our event, but also made it a point to mix and mingle before, during and after the vent with many people until we packed it away at midnight. The key thing I noticed was how comfortable you were with the introductions of our key dignitaries. You transitioned between John Brogden, MP, Liberal Leader and Opposition Leader; Bruce Baird MP, Federal member for the Cook Electorate, Sutherland Shire Mayor and Councillor Kevin Schreiber, and District Governor 9750 Bob Richards with ease. Your suggestion a few weeks ago to include another MC such as Camille Valvo, proved valuable and gave a balanced approach. This made for a more interesting evening for everyone and in particular, the second half of our program. It is always a pleasure to have you speak or judge at our Rotary meetings and support us as an Honorary Rotarian Member. Thank you for being available between your trips from Sydney and Singapore on such an important occasion as Rotary International's Centenary Celebration. On behalf of the Illawarra Area Consultative Committee and Illawarra Business Club, thank you for your presentation on 8 March entitled, "21 Small Business Success Tips That Get FAST Results". Rob, we have seen you as a workshop presenter, speaker and Master of Ceremonies on numerous occasions since 2002. Your style and materials are always refreshing and meet the needs of each group. Our eighty or so guests learned 21 key ideas and bonus concepts in about 40 minutes. You delivered valuable insights to business people who run small businesses to those with large staff and turnover in the Illawarra area. We look forward to seeing you in the future and thanks again for helping kick off 2005 or us as our lead off speaker. Thank you once again for your professional manner in assisting the NSW National Trust of Australia with our 2004 activities at Old Government House. Your role as event MC and auctioneer at our April Colonial Ball and dinner superbly linked our members, contributors and community with value and fun. I write this letter as a follow up to congratulate you as our MC for our private dinner function featuring special guests Premier Bob Carr, his wife and invited guests. Your role as MC imparted a unique touch to the grandeur and setting in the main dining room of Old Government House. Your arrangement of the singer and music for the evening entertainment capped a very special occasion. Rob, I am very grateful for the way you honoured your commitment to the National Trust NSW. You ensured the event was special and unique for all. "On behalf of the NCC, I express our gratitude for your generous support of September Breakfast Seminar. Your remarkable marketing and hosting skills as MC made the event a very successful one. We look forward to working with you in the future." "Thank you for your outstanding role, yet again, as Master of Ceremonies at our 2004 Institute Student Achievement Awards. You are an absolute pleasure to work with and such a professional. I thank you for the ease with which you handled all the last minute changes and the fun you brought to the evening. Rob, having the most important VIP in the room hand you his card at the end of the night is testament to just how good you are!" Once again, thank you for your contribution to the success of our recent Institute Student Achievement Awards. I appreciate your support and the professionalism you bring to the role as MC on the evening. With the growth of the event this year, (from 300 in 2003 to 500), it was remarked we were able to meet our time frame and I congratulate you on your management of the evening." On Behalf of the American Chamber of Commerce, Thank You for chairing our recent AmCham breakfast briefing with Kirby Adams, Managing Director and Chief Executive Officer of BlueScope Steel Ltd.
We appreciate your help in making the event run smoothly for all of us (and the 105 members and guests who attended the Sydney Shangri-La Hotel). Please let me know if we can help you in any way". Thank you for "wowing" NSAA members and guests as Master of Ceremonies for the NSW Chapter and State meeting on 20 May at the Darling Harbour Novotel. In fact, this meeting was the largest meeting we have had with 120 people confirmed and I believe the largest attendance since November 2002. As Chapter Program Director, it became a real buzz to have our local CSP's Martin Gruenstein and Candy Tymson for the second half of the program as they brought strength to our impressive lead off speaker, Brian Tracy CPAE. My letter is to compliment you as our MC on your great job in setting the scene for a night worth remembering. Your presence helped set the room ambience and of course, your introductions of the program, the speakers and participation with the audience with the colourful balloons to "break the ice" was run to clockwork. Thank you for assisting us with such a full program. In keeping to a tight time frame and finishing at 9:30 PM, we had plenty of time for networking and fun afterwards. We look forward to having you back for other programs and know other will benefit from your enthusiastic and professional MC skills. On Behalf of the American Chamber of Commerce, Thank You for chairing our recent business briefing ("Location, Location, Location") with Peter Barge, Chief Executive Officer of Jones Lang Lasalle. We appreciate your help in making the event run smoothly for all of us (and the 90 members and guests who attended the Sydney Four Seasons Hotel). 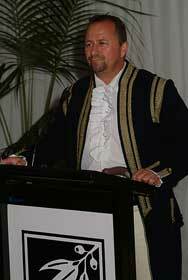 I write to thank you for supporting the National Trust Colonial Ball, held here at Old Government House on Friday evening, 23rd April 2004. Your role as MC and Auctioneer was a demanding one. I do not hesitate to say that you carried it off with your usual competence and professionalism. Your enthusiasm certainly enlivened the proceedings - it was a night to remember. Rob, your contribution to the evening was of great assistance to the National Trust to raise much needed funds to help conserve Old Government House, part of the heritage of Parramatta". On Behalf of the American Chamber of Commerce, Thank You for chairing our recent executive education tutorial (on "Media Skills for Business Executives") with Anthony McClellan of AMC Media (1979-1993 Producer/Director of 60 Minutes in Australia). We appreciate your help in making the event run smoothly for all of us (and the over 55 members and guests who attended the Sydney Shearaton on the Park Hotel). 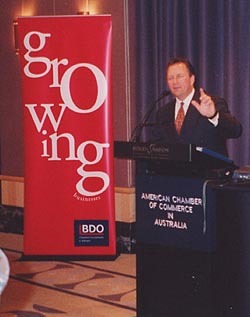 Thank you for your outstanding MC efforts at the Small Business and Regional Development breakfast launch on 11 February 2004. With over 80 people in attendance, there was strong advocacy for regarding our community, the cycling industry and cycling improvements in our region. Your on stage comments had a powerful impact and influence on the audience in relation to cycling issues, economic and social development. Our six program speakers looked relaxed, yet confident, which is the sign of a great MC. This function required the utmost professionalism to show the less optimistic that our community has a say in development and positive change. Thank you for your organisation and professional delivery - it was wonderful to have you there". 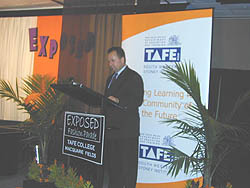 "Thank you for your expert performance as our MC at the 'Exposed 2003' Fashion Parade organised by our staff and students at Macquarie Fields College. Rob, your contribution and humour were significant in making the evening so successful for the 150 staff, students, parents, guests and sponsors". "Rob, thank you for superbly handling all the formalities of our company opening with so many of our clients, suppliers and friends. You kept things on track, the mood was very upbeat and added allot of fun with everyone involved with the balloons in the beginning of this occasion. 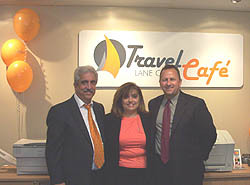 We have continued getting good feedback from this special event....stop by anytime". "On behalf of the Board of the Australian Rotary Health Research Fund, thank you for being our guest MC at the Rotary Club of Hurstville's Mental Health Forum. Rob, thank you for your continued support of this program. You are helping the community to understand the myths surrounding mental illness, as well as moving to de-stigmatise mental illness and raise awareness of the need for early recognition and treatment". 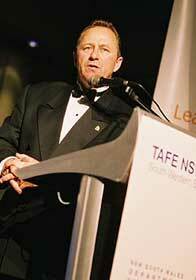 "Thank you for your outstanding services as Master of Ceremonies at our 2003 Institute Achievment Awards. The event was a huge success and is still being enjoyed by the 300 people who attended. Your services as MC were entertaining and ensured that the event was of high standard. The use of the balloons in the middle of the program had a huge impact and added fun to all present. [One of the many positive comments that followed was that we started late due to kick off entertainment challenges, however, you were able to make up for lost time without the night or program feeling hurried. The expertise and experience you have ensured the program ran smoothly and every guest had a great time. 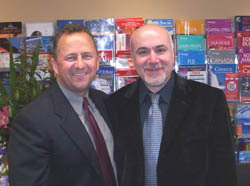 Thanks again for making my job of event coordination easy on me and we look forward to seeing you back in 2004". "On behalf of my fellow speakers and BDO partners, thank you for the first rate job of emceeing our recent American Chamber of Commerce breakfast event. We were very grateful for the effort you made in setting the scene and putting the issues in context for the audience. Over many years and many events, your professionalism has shone above all others". "An 11 on a scale of 10. That is what our partners and the other corporate panel speakers had to say about the fantastic emcee work you did for us earlier this week. As the host Sponsor for the July American Chamber of Commerce Breakfast event in Sydney, we needed to ensure the message from our panel of attorneys, partners and accounting experts was delivered in the best forum and setting possible. When you were recommended, we were confident it would be a good result, however, you exceeded everything we had thought would occur. The smooth opening to the morning plus our company advertising and message blended nicely into the program and added the flair and enthusiasm the 230 guests needed first thing in the morning. It was mentioned by those who flew down to our Melbourne event for the next day, that the "something" that was missing from our breakfast program in Victoria was clearly you. Don't get me wrong when I say our event was not a success, but it was not an 11 on a 10 scale. Our follow up responses in Sydney this week have been very exciting and we expect to pick up allot of new business from the efforts of our breakfast client briefing and event. Thanks again Rob - I look forward to working with you on other projects in the very near future". "Wow! That is the feedback time and time again from dozens of the 200 people at our charity event. Thank you for all your help as our Emcee for our third annual Charity at the Norwest International Hotel last Friday night. Your efforts on the night in working with the Ronald McDonald House, Inala, St. Gabriels School for the Hearing Impaired Children in conjunction with the Norwest Hotel and Arab Bank, helped raise in excess of $ 36,000 on the night for us. Your expertise in keeping the program on track was only upstaged by your humour and personal touch in keeping all the pieces seemleesly together for a fantastic night". We look forward to seeing you back in 2004. "Thank You for your help regarding my IT presentation during my recent trip to the National Capital in Canberra. I was particularly impacted with the way you helped set up the room of my presentation the night before at 10:30 PM and checked every detail after we arrived at the Rex Hotel. The sound system, lighting, tables, screen set up and atmosphere were ready for the next morning. All of that makes a big subconscious impression in presentations and from all accounts, the delegates had a great morning. The added bonus was having you introduce my session and building my credibility as an expert in a fun, entertaining and professional manner. Keep up the good work and I look forward to seeing you in the near future". Rob, WOW - what a great group of business people. I understand 115 people were at my function last night and it showed. I have to say, everything for me ran to the minute and smooth. It was really a lot of fun to work with you and the NSAA after a three-year lapse. I look forward to coming back in the next few months for further events and thanks for organizing this opportunity to engage with such a high profile group of business people in Sydney. "Thank You for the invitation to be part of the six speaker team last night...we all enjoyed ourselves very much (with the audience of over 95). I was particularly impressed with the way you set up the meeting before hand and checked every detail. All of that makes a big subconscious impression. I have been waiting a few years for someone to cross every "t" and dot every "i" the way you do...keep up the good work". "Wow, what a fantastic night with our top clients, suppliers, corporate team and guests. We have been putting this one night together from concept to in place for over 3 months. This has really shown us what is possible when you can get your best clients together for a special occasion to show off very selective and particular new lines of products to our most important high-end clients. The feedback from the night has been excellent. I am grateful for your planning, working with our team, the actual opening on the night for me personally and taking care of the things on the back end with our many clients who had a great time. The new product orders are going to more than take care of everything we put into this...let's keep working on new things and see you soon". "Rob, the reports came in while I was overseas and thank you for setting the tone for our recent two large scale events in Melbourne and Sydney. I would not have trusted the importance of the opening of our event with over 1900 people in Melbourne to an amateur. The conservative nature of our Melbourne market means we need someone who speaks clearly, sets the stage for the whole night of things we have planned and allows our quests to feel that they know how the program is going to flow on the occasion. You did that and the feedback has been very good. I also wanted to Thank You for coming back to help with our opening for our Home Bush Stadium event to over 1700 people....we had a great night and the enquires and new business for some of our newest events is exciting. You did a great job in getting everyone ready for a fun, educational and uplifting night with our CEO and team. I will be glad to refer you on to others who may have a need like this. I look forward to seeing you soon and working with you on future projects". 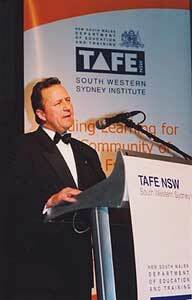 "Thank you for your enormous contribution to our gala night on 13th May 2000 at the Sydney Hilton. Our 300 guests, international dignitaries, local government officials and MPs had a great night. As an MC and a speaker you were instrumental in helping us raise over $60,000 in sponsorship and member donation revenue on the night. I also appreciate you sacrificing your time and missing another special event that weekend just to be with us". Rob has worked hand and hand with staff and teams in large function and events held in Sydney, Melbourne and Singpore. This includes the Melbourne Crown Casino, the Sports & Entertainment Centre at Home Bush (site of the 2000 Sydney Olympics), the Darling Harbour Convention Centre, the Liverpool Catholic Club, Raffles Convention Centre in Singapore, The Singapore Grand Copthorne, the Singapore Suntec Convention and Visitors Centre the Singapore Mandarin Hotel, the Singapore Marriott, Langham Place Hotel Hong Kong, the Sheraton Hotel Hong Kong, the Venecian Hotel Macua China, the Sheraton Hotel Salzburg Germany, Hilton Hotel Munich Germany and Sheraton Arrabella Hotel in Nurnburg Germany. Other venues and hotels include the Norwest Crown Plaza Hotel, the Menzies Hotel, the Marconi Club Western Sydney, the Sheraton Hotels in Sydney, Melbourne and Perth, the Hilton Hotels in Brisbane, Sydney, Melbourne, Auckland New Zealand and the Sydney Four Seasons Hotel. The Rydges Hotel Group in Sydney, Melbourne & Canberra, the Park Royal Hotel Group in Sydney & Parramatta, the Novotel Hotel Group in Sydney, Brighton Le Sands, Melbourne, Canberra & Coffs Harbour. The Epping RSL Club, the St. George Leagues Club, the North Sydney Leagues Club, the Castle Hills RSL , the Canberra Rex Hotel and conference locations outside of Australia in New Zealand, New Caledonia, Vietnam, Greece, Japan, Canada, Mexico and the United States. For more information about having Rob Salisbury as a professional MC, host, facilitator or presenter / evaluator for your company or association event, e mail * **.